With 174 LOC built on top of Spectus expectation library, facilities such as benchmarking and mocking are not supported. Fix offers however a consistent DSL to focus your BDD. While specs behave like documents which can be logic-less, their interpretation should not be questioned regardless of the version of Fix, preventing from software erosion. Also, Fix specs are compliant with RFC 2119. Monkey-patching, magic tricks and friends are not included. Instead, animated by authentic and unmuted Ruby objects, unambiguous, understandable and structured specs are encouraged. Rather than a random order option to help finding bugs somewhere (and sometimes luck), Fix prevents from side effects by running each context inside a distinct sub-process. As it behaves like a function, no matter how many times you call it, the build status remains the same. 1. 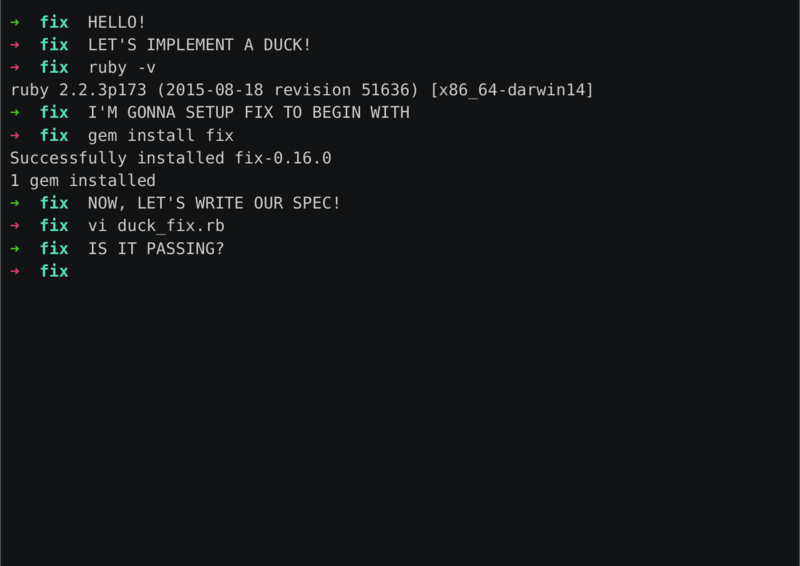 Info: undefined method `sings' for #<Duck:0x007fb60383b740> (NoMethodError). As a basic form of security Fix provides a set of SHA512 checksums for every Gem release. These checksums can be found in the checksum/ directory. Although these checksums do not prevent malicious users from tampering with a built Gem they can be used for basic integrity verification purposes. Fix follows Semantic Versioning 2.0. Generated on Sat Apr 20 18:35:05 2019 by yard 0.9.19 (ruby-2.5.1).